AMSIOS maintains a list of all files of your choosing in one convenient location no matter where they actually reside on your system, even if they are buried deep on one of your hard drives or even in a network location. You'll no longer need to remember which folder contains the file, or even remember its name. From within AMSIOS, you may Preview, Launch, Copy, or Edit the details (filesystem Comment and Tags) of each file for easier identification. 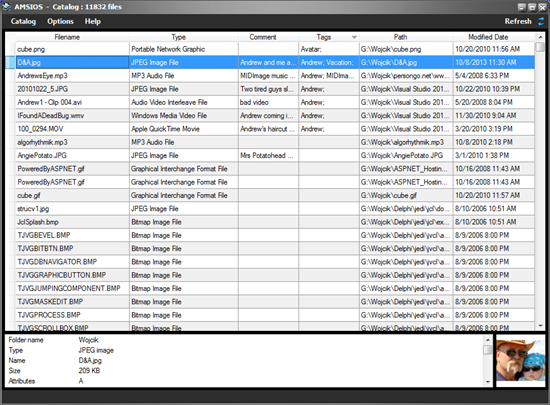 AMSIOS also allows multiple catalogs to better group files by type - for instance: Images, Videos, Music, etc. This beta version has only been tested on Windows 10 64bit so far. It requires .NET version 4 (which should already be there). It may or may not work on other Windows versions, if .NET 4 is present.